Blue Moon Hotel NYC i New York, USA: Bestill nå! When Booking thru Thirds party website , online 10% surcharge will apply . When booking directly with Hotel 10% surcharge will be waved . Please contact our hotel for a payment detail. Terms and Conditions : Group Booking Policy require full payment to be made 31 days prior to arrival . In case of late payment , late payment fees will apply . Group Bookings Cancellation Policies : We require 31 days notice of any cancellation via E-mail only . In case of any late cancellation or no-show 3 nights + tax will be charged . 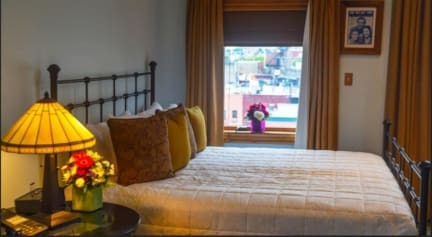 Blue Moon Hotel is located in the trendiest neighborhood in Manhattan, Lower East Side. Lower East Side is a prime shopping, dining, drinking and sightseeing territory. It’s the Manhattan’s most fashionable neighborhood. Our guests say “stuff are nice and hospitality”, this is “One of the cleanest hostels they stayed in”, we have “Great location, in a lovely part of town- walking distance to all the major sights “, they think it’s “Exceptional value for money”. 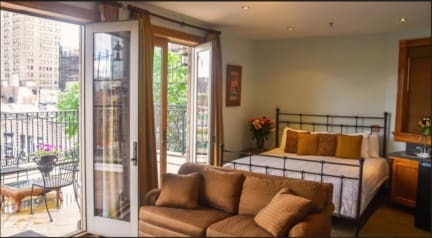 We are walking distance to Greenwich Village, East Village, SoHo, Chinatown, and the Financial District, Little Italy. There is a metro station within a block with a metro lines F,M,J,Z, connecting to Times Square, Herald Square, Rockefeller Center , Central Park, Penn Station, Brooklyn, Queens. Can take you throughout all of New York City easily and conveniently. The best bars, restaurants, cafes, supermarkets, galleries, and museums surround us. Laundry facilities and Parking is right next to the Blue Moon Hotel. A 20-minute ride from LaGuardia airport, and a 25-minute ride to JFK International airport. The property is ultra-clean with free high-speed Wi-Fi throughout all areas of the property. We offering brand new lobby with café/restaurant and best common area where you can relax watch TV and meet other travelers. Our multi-lingual staff will help you with all your travel needs and will give you inside knowledge on all major events in New York City, as well as informations on local activities. All our suites and lodging accommodations feature: Heat and A/C with individual temperature control, private bathrooms with deep tubs, showers, hair dryers, all bathroom amenities, walk in closets, balconies, 4.5 cubic foot refrigerator with mini bar, bar sink, table & chairs, coffee makers, Free WiFi, voicemail, cable, safe, alarm clock, iron & ironing board. This property may pre-authorized your card 5 days before arrival . When your reservation have free cancellation 5 days prior to arrival than Hotel may pre-authorized your card for the fist night and balance due you may pay on arrival . Check in from 3 PM to 11:30 PM . If you are late to check-in or your flight is delayed , please reach out to us directly via e-mail.